What can you learn from a flow survey or spot check? In an ideal world, we'd install a fixed system to monitor liquid or steam flow. We'd check the device accuracy every once in a while, but for the most part, we'd trust the results. But did you know that the condition and age of your pipes can affect flow measurement readings? Do you have processes in place to verify that your installed flowmeters are working correctly? How do you identify leaks in the system? A spot check or flow survey with a portable clamp-on flowmeter may be a simple way to keep your system operating effectively and efficiently. Earlier this spring, GE Measurement & Control account manager Dan Kilpatrick presented a webinar for our partners at RAECO-LIC LLC, discussing a variety of uses for portable clamp-on ultrasonic flowmeters in survey applications. 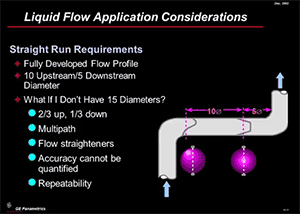 In Six Critical Things You Can Learn from a Flow Spot Check, Dan talks about ultrasonic flow measurement, and specifically the six critical things you can learn from a portable flow survey or spot check and how they can save you time, money, and improve your process. Watch the webinar in its entirety and download the slides at RaecoRents.com. Looking for a portable clamp-on ultrasonic flowmeter for a spot check or flow survey? Rent a GE Transport PT878 Panametrics clamp-on ultrasonic flowmeter.